Last fall I drove from Oakland, California, to Memphis, Tennessee, and back in 10 days with the aim of gauging Memphis as a place to relocate. I was single, recently laid off with a new job that was not a career, and after 13 years was genuinely exhausted by living in the Bay Area. It felt like my newly rediscovered passion for knitting and my good friends were the only things keeping me sane. This road trip was supposed to be a vehicle for self-discovery. Could I start over somewhere else? Did I want to? What was I supposed to do with my life? The only revelation the trip gave me was that while I could drive more than 1,000 miles in a day, I probably should not. [Hint: lumbar support cannot be overrated.] Though I fell in love with Memphis [and Elvis! ], I was not ready to commit to relocating and I still didn't know what to do with my life. I stopped in Little Rock, Arkansas, to visit with my aunt before heading back to California. She lives mere blocks from the Handworks Gallery, a shop whose ads I had seen in knitting magazines and whose online selection I drooled over. Located in an old house in a great part of Little Rock, it has floor to ceiling yarn in all sorts of nooks and crannies, great staff, and inspiring finished sweaters. I had just started knitting again last August after a several-year hiatus, buying tons of ill-considered yarn, knitting away willy-nilly. My haste showed. I made a pretty sweater in inexpensive cotton from a pattern meant for wool. It looked good, but the fitted sleeves which should have been merely snug were like tourniquets in cotton. A sweater I knitted in bulky wool is snuggly and soft, but hotter than Hades. 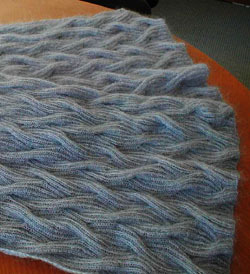 If knitted in the bulky cotton-blend the pattern recommended, it would have been just right. I stood in the shop, feeling an overwhelming if aimless desire to create. I grabbed some pretty pale blue merino, some tools and do-dads, and seven skeins of Rowan Kidsilk Haze in "chill," a pale grey. I gazed at my new stuff for hours before setting off home, itching to get my hands on it. I drove from Little Rock to Albuquerque in one day, a meaningless accomplishment next to my desire to dive right into the yummy merino. But I knew that unless I took time to consider what I wanted to do I would make a mess of it. Once home, I read Maggie Righetti's Sweater Design in Plain English. My recent sweater disappointments were a lesson that yarns are not interchangeable. Sweater Design reminded me that forcing a yarn into something it should never be leads only to frustration and unworn [because they're unwearable] garments. I listened this time. I made a swatch and discovered that the mohair in Kidsilk Haze will not allow you, under any circumstances, to gaily rip out stitches. But I fell in love with its softness. I tried to coax it into speaking to me so I could make it into something. Weeks later I had a eureka moment. I was thumbing through my books and right there in Vogue's American Collection was Lily Chin's reversible rib cable shawl. Perfect for Rowan's Kidsilk Haze? I thought so, and the yarn agreed. 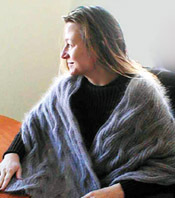 The shawl has sinuous cables running the length of it, bumping each other suggestively. 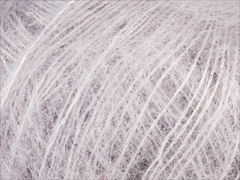 The pattern's architecture would shine in the tiny silk twist in the center of the yarn, and the fuzzy mohair would soften it. Intricate looking, but not too technically challenging. My head swam with a vision of me in the completed project: elegantly draped, sophisticated and alluring. And demonstratively a very accomplished knitter. I planned to finish it, this shawl/scarf Thing, in about a month [!]. I knit fast, and my daily commute guaranteed me at least an hour a day to do it. I happily cast on with size six circular needles, switching to sevens as called for. The rhythm of the pattern soothed me: knit two, purl two, knit two, purl two. Such a nice rhythm, a lazy, hummy sort of rhythm, perfect for bus rides, idle moments, television watching. The yarn was so thin running through my fingers, it needed more concentration than I was used to, but it was light and fluffy once knitted. 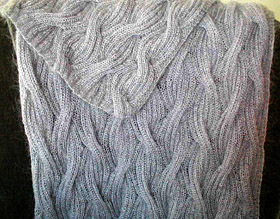 I negotiated my first cable row easily; the following row made me realize I had knitted too tightly. After huffing, cursing and coaxing that row, I relaxed a bit and marveled as the Thing began to grow. As it grew, people noticed. Even at eight inches long, it was soft, intricate and lush. I knit while walking, and people would ask me what I was making. Was it a sweater? Scarf? Baby blanket? [As if!] I would answer that it was "a wrap-y shawl Thing" or "a kind of a scarf-y wrap Thing," or if I was feeling flirty "a kicky little evening cape-y Thing." I invited people to touch it, doing a little "voila!" flourish to show the reversibility, amazed along with them at what I was making. On went the rhythm of knit two, purl two, my stitches timed to my footsteps, or to the flap of the bus' windshield wipers, or to my dog scratching herself. Fellow bus riders told me how pretty the Thing was. "I wish I could knit" some said, or "I could never do anything like that." Sometimes I assured them that it was not really hard, it just looked that way. Sometimes I kept it to myself, nodding grave agreement that knitting is difficult, that this particular pattern was excruciatingly complex. It was wonderful, I was impressing knitters and lay people alike. The Thing became symbolic of the innate strengths and talents I had. I could do anything! I could move, find a new career, start all over, or stay, or anything. Then the unexpected happened. I fell madly in love. Suddenly I was relinquishing my heretofore inviolable knitting time in favor of gazing into the eyes of my sweetie. Sometimes he rode my bus and I would not knit at all, preferring instead to hold his hand. My solo tradition of Thursday nights of bad TV and marathon knitting was replaced by nibbled-at dinners, smitten conversation and smooching. Sometimes days passed and I would not knit a stitch. Progress on the Thing crawled and the slow pace was frustrating. Rationally, I knew that I was giving up [cheerfully!] knitting time to be with my sweetheart, but some part of me felt like that time should come out of a secret surplus time account. I became irrational, angry at the Thing and the yarn it was made of. I would look at other yarns from my stash, muttering to myself that they wouldn't take so long to knit. I could finish a whole garment with any one of them in a weekend. Unlike this thin yarn that takes so long to knit and is unforgiving of errors. And of course in my anger I began to make errors. A loaded cable needle that needed to be held to the back was held to the front. Once on the train home from a baseball game I picked up the now Damned Thing near the beginning of a row and finished that row and most of the next before realizing I had gone the wrong way and created short-rows. [Hint: beer and knitting do not mix.] Unknit two, unpurl two. It was ghastly. I wanted to finish this Damned Thing and get it over with, to spend time with my sweetie without feeling like the Damned Thing was waiting to be done. I still carried it around with me everywhere, working a few stitches here and there, but my confidence was crumbling. The comments I got, once supportive, now were subtly mocking: "Still working on that, eh?" "You're not done yet?" At first I would smile weakly and say "It's getting there." After a while, I became defensive. "Yes," I crisply answered, "I'm still working on it. It's quite complicated, you know." When I returned to the optometrist for my glasses, I skulked in and out to avoid a lame explanation that three inches was really all I could get done in two weeks. I became obsessed with completing it, like the Damned Thing and I were in a battle to the death. I took to wearing it wound around my neck, its unfinished end dangling free so I could pick it up whenever I had even a second to knit. It felt sometimes like it was constricting me on purpose. I no longer heard the comments of coworkers, commuters and friends. I barely nodded acknowledgement of their existence. I would let the phone ring if I was knitting, cursing the interruption. But the Damned Thing finally showed progress. And no errors. Three months after I started my one-month project, I was down to the last skein. Every few rows, I squeezed the yarn to feel how much was left, relaxing as it got thinner. The Thing seemed to loosen its hold on my neck and the ease of the gentle knit two, purl two cadence returned. By the time I put the size six needles back on to finish it, I found again a peaceful and trance-like oneness. Six rows from the end, I discovered a misdirected cable nine inches back and with a beatific smile decided to allow it to remain. Casting off the last stitch was a profound moment. I paused reverently, then tossed the Thing into the air and caught it, enchanted by the light filtering through the stitches. It was a few days before I darned in the yarn ends, now unwilling to let the Thing go. I was dismayed by a little tug of post-completion melancholy. I waited to tell anyone I had finished it, though I had promised everyone that my victory whoop would echo for miles. I wanted to keep secret my terrific sense of accomplishment that said I could handle any challenge - even the challenge of staying in the Bay Area. I was confident, in love, and a knitter of a very cool Thing. Kate Boyd listens to embarrassing classic rock and buys too much yarn. Aside from the project described herein, her most recent accomplishment was the successful suspension of Easter Peeps in a cherry jello mold. She hopes to be a teacher in the fall. © 2003 Kate Boyd. Contact Kate.